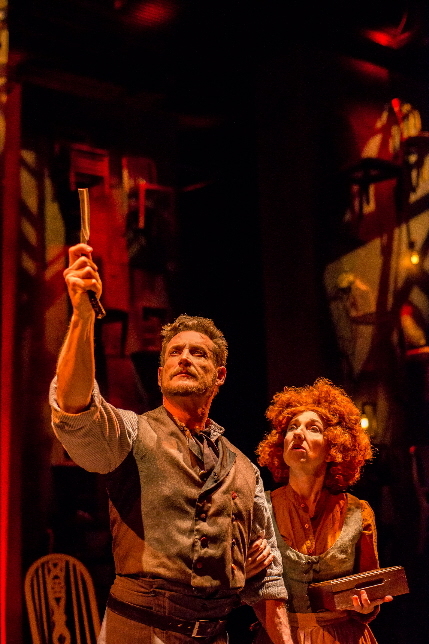 Ever since Stephen Sondheim and Hugh Wheeler’s bloody brilliant, massive, large-cast Sweeney Todd: The Demon Barber of Fleet Street arrived on Broadway in 1979, subsequent takes on the show have grappled with how to deliver its oversized emotions and exquisite score on a reduced scale. That presents an enticing challenge for a director, as Patrick Fitzwater of Slow Burn and Clive Cholerton at Palm Beach Dramaworks have each demonstrated with success. Now comes Stuart Meltzer of Miami’s Zoetic Stage, who seems to be working his way through Sondheim’s output with ingenuity and skill. True, his downsizing of the cast to a mere eight is occasionally problematic, but when you have two such bravura performers as Aloysius Gigl and Jeni Hacker as the vengeful Sweeney and his pie-baking partner in crime Nellie Lovett, minor staging missteps can be forgiven. Based on a classic British “penny dreadful” tale of a barber exiled to Australia by a corrupt, lascivious judge, Sweeney now returns to London intent on murderous revenge. So he slits the throats of his tonsorial customers while he waits to do in the judge. And being a practical woman, Mrs. Lovett proposes baking the corpses into pies – a real boost to her business. The body count does mount, yet during one of the most suspenseful and potentially violent moments in the show Sondheim offers one of his loveliest melodies, “Pretty Woman,” as counterpoint. And at the end of the first act, Mrs. Lovett suggests her scheme for disposing of the dead bodies in a pun-filled waltz, “A Little Priest.” In what is arguably the composer’s most intricate score, musical director Paul Tine gets a remarkably full sound from his six-piece orchestra. Gigl, a Carbonell Award winner for his Javert in the Maltz Jupiter’s Les Misérables a few seasons ago, has an impressive brooding intensity as Todd and a commanding baritone singing voice. Other Sweeneys may have been more unhinged, but Gigl’s interpretation is certainly persuasive. Surely it is not his fault that Hacker’s Nellie Lovett draws our attention whenever she is onstage. Also a Carbonell recipient – for Passion’s Fosca on this same Arsht Center Carnival Studio stage – she brings such a range of shadings to a role that can be one-dimensional. From her opening dough-pounding “Worst Pies in London” to the violent finale, she is a marvel – part comedienne, part Lady Macbeth. Kimberly Doreen Burns (Dot in Zoetic’s Sunday in the Park) gets quite a workout doubling as the Beggar Woman and Aldolfo Pirelli, Todd’s rival barber and early victim. The same goes for Kevin Veloz, a New World School of the Arts student making his professional debut as gullible pie shop assistant Toby, as well as a succession of Todd’s not-long-for-this-world customers. Also new to Zoetic is Nate Promkul as naïve sailor Anthony Hope, whose sweet tenor and offbeat line readings make him a standout. Natalie Taveras’s scenic design is minimalist, but the stage floor has two concentric revolves, which allow a satisfying solution for disposing of Sweeney’s corpses in the absence of a trap door. Taveras also serves up a back wall full of chairs, intriguing if a bit mysterious. (Sondheim crossed with Ionesco?) Without much set, the design emphasis is on Rebecca Montero’s macabre under-stage lighting. Marina Pareja’s costumes are period-apt and brimming with character. If she also devised Hacker’s piled-high red wig – which brings to mind a Matt Groening cartoon – give her extra credit. Zoetic’s production is so powerful and Meltzer’s staging has so many clever touches, we might as well pick a few nits. The shaving competition between Todd and Pirelli doesn’t make much sense with only one face to be shaved, the second act opening at Mrs. Lovett’s spruced-up pie shop really needs a crowd to suggest its sudden good fortune and the scene at Fogg’s asylum was eliminated entirely, leaving a gap in the narrative. SWEENEY TODD: THE DEMON BARBER OF FLEET STREET, Zoetic Stage at the Arsht Center’s Carnival Studio Theater, 1300 Biscayne Boulevard, Miami. Through Sunday, April 7. $55. Call 305-949-6722 or visit zoeticstage.org.